Paste to provide clear indication of the gasoline level in tanks. Simple and quick detection. GASOLINE FINDER to detect the level in tanks with gasoline and other light mineral oils, that are otherwise difficult to determine as they evaporate quickly. Apply the paste on the lower part of a clean gauge / measuring tape and lower it to the bottom of the tank. Directly after pulling up, the level of the fuel/oil can be read by a distinct red colour change. 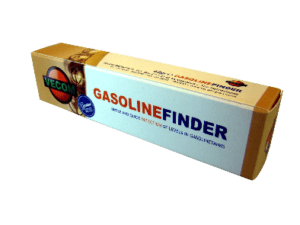 GASOLINE FINDER is usually available in boxes containing 20 tubes of 60 gram.